Categories: Ceramics, Vessels. Tag: Islamic Albarello. A cylindrical vessel supported by a disk-shaped foot, with a small shoulder and a low neck terminating in a rounded rim. The decoration represents an inscription in Kufic, which repeats several times the word Allah on the body; on the shoulder, the finer inscription appears to be pseudo-Arabic (the painter probably didn’t speak or write this language). The texts are rendered in negative, since they clearly stand out in white (the color of the glaze) between the golden brown outlines of the painting. These vessels were originally intended to store spices (in Iran from the 9th century, and in Syria from the 12th century onwards), but also dry drugs and ointments for pharmaceutical use. 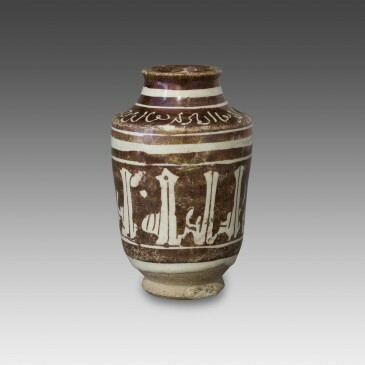 Known as al-birâm in Arabic (earthenware jars), they also enjoyed a great success in Europe under the Italian name of albarelli. 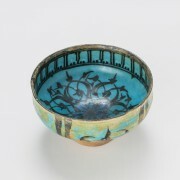 This manufacturing technique, known as metal luster technique, is among the most important contributions of Islamic craftsmen to the development of ceramics. The pottery (light beige terracotta here) was first covered with a glaze (creamy white color in this case) and placed in a kiln, in an oxidizing atmosphere, up to 900°-1000°. 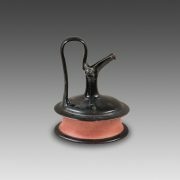 After cooling, a mixture of silver and/or copper oxides, together with ocher and vinegar, was applied to the surface of the glaze. The vessel was then given a second firing at a lower temperature (600°-700°) in a reduction kiln, which excludes oxygen. The glaze, melted by the heat, could thus incorporate the paint in a very thin and glossy film of metal. 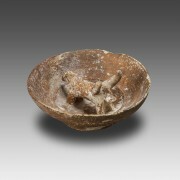 Probably invented in Iraq, the power center of the Abbasids, between the 8th and 9th century, this technique was widely used by potters in Cairo under the Fatimid dynasty in the 10th and 11th century, before spreading to the Iranian and to the Syrian world. Complete, in excellent condition. Minor chips (foot); the painting retained its original luster, but slightly faded in places, especially the interior.